Kopron and Sirap Gema have recently cooperated together. Sirap Gema, part of the Italcementi group, a huge Italian multinational company in the cement sector, needed to increase space dedicated to storage of raw material, Kopron met their requirement by installing two temporary warehouses spreading over 3000 m2. Sirap Gema are leaders in the international market in the production of fresh food packaging. 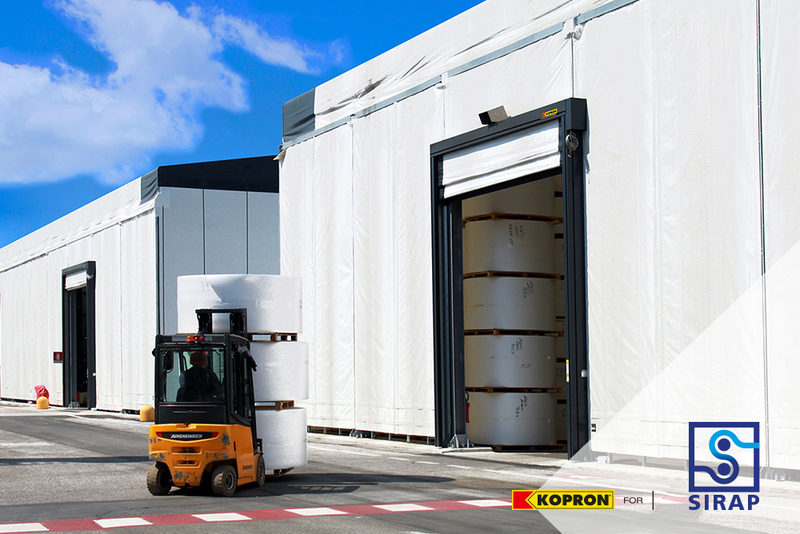 Kopron helped the company to improve logistics processes by installing two big warehouses covering an area of 3000 m2, for storing plastic raw material. Sirap Gema have chosen Kopron for the well-known production efficiency and service quality offered by the company in over 30 years of activity, and for the integrated projects which allow customers to work closely together with Kopron technicians to find a tailored solution for their needs. 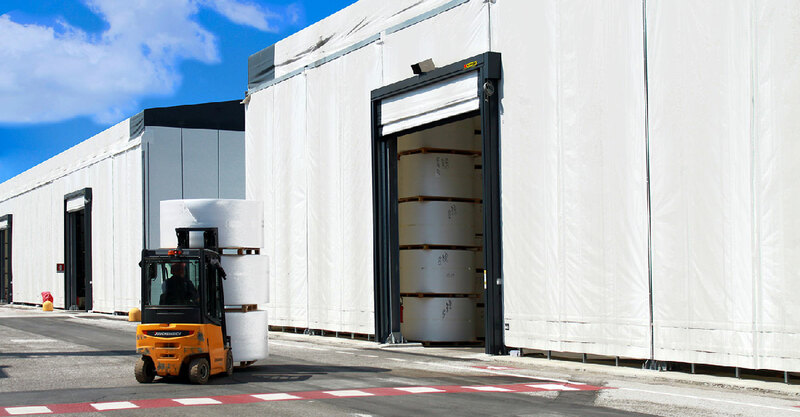 The two warehouses are both 8m tall, so plastic material can easily be piled up and big size loading/unloading trucks can be hosted without problems. Four fast opening doors model Fast Pack shut the warehouses. 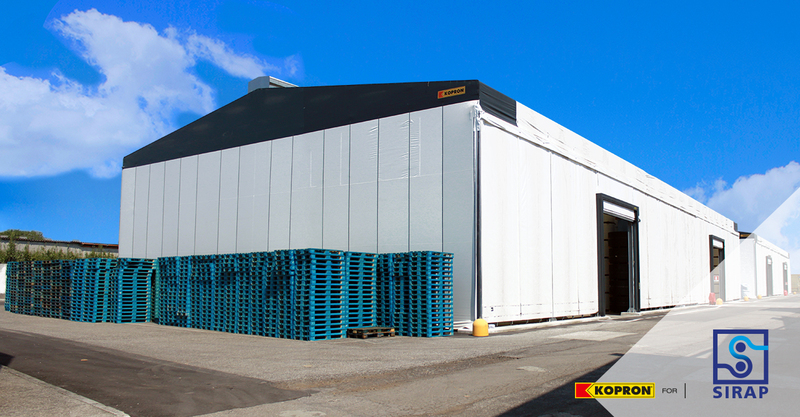 This combination of warehouses and doors offered by Kopron, produced many advantages thanks to two factors: one to the flexible anti-seismic structure made in steel, and the other to the easy and quick installation, which requires very little paper work and no maintenance. 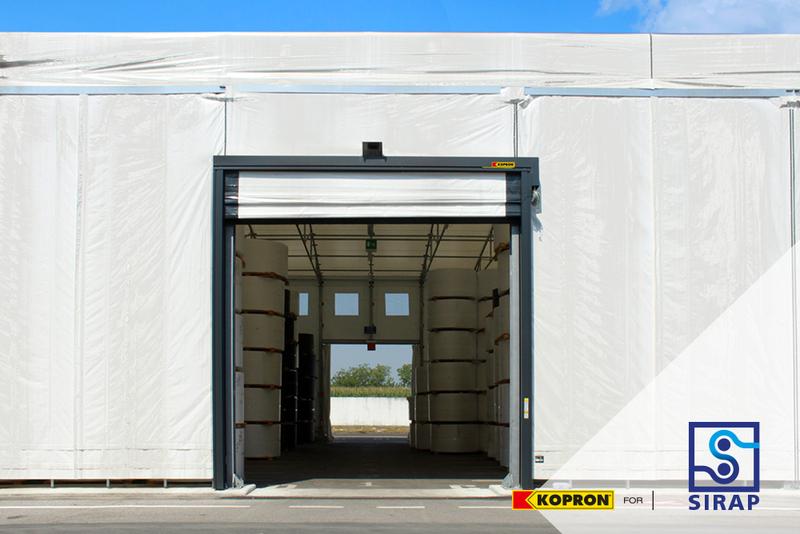 All Kopron products are designed and produced to last long in time: the fabric covering the steel body is in anti-tear, Class 1, self-extinguishing PVC. The fast folding doors are of same material. Fast Pack doors are designed to bear very frequent opening/closing movements. 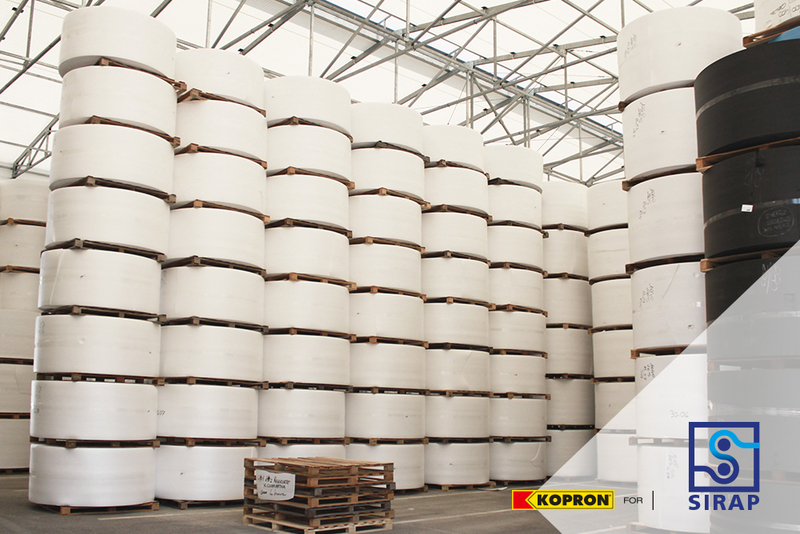 “The careful selection of suppliers and materials, the special attention given to production process and quality control guarantee a product which complies with European standards and is totally up to the most demanding customer requirements”: Kopron, one of Sirap Gema’s historical suppliers, fully met the company’s expectations.